Perhaps it would be a good time to buy some call options on Yamana. The price is near its low range and the RSI looks oversold. Monday will be the expiry date for gold and silver metals options. I think the 12.50 strike with expiry in Jan 09 would be suitable. I will note that this idea is not mine. I got it from http://www.gold-prices.biz. I am humble enough to get good ideas from others, and if it makes me money, I'll gladly be called a monkey for it. I have thought of other option plays in the PM sector. I would not use options as a general strategy year round. (Pardon me if this sound obvious to those of you who are well informed.) But they are ideal as volatility plays when exploiting seasonality. In many cases the juniors have not provided the expected volatility when coming into the fall season. As senior producers don't give much in the way of leverage as stock investments, I think that options provide that way of exploiting more predicable leverage in the seniors as the PM complex hits oversold levels in late summer. 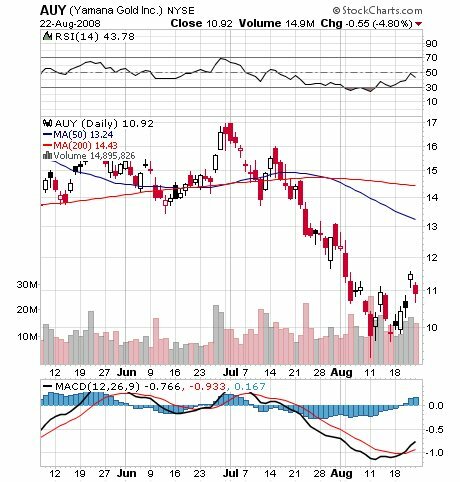 I am looking at Kinross Gold and GLD, the gold trust for good price points and oversold conditions that can give a good deal on option strategies. I think Jan09 Kinross options with a strike price of $20.00 could provide such an opportunity. Last week these call options had good prices that could give reasonable expectations of around 100% profits. At some point the underlying GLD shares in August could provide a good opportunity for such entry as well. Try to look for well priced at the money options as this seems to be the least risky contract. I have not made any hard and fast suggestions on KGC or GLD. As you know, give yourself stop loss and time limits to minimize losses if at some point things should go against you. This might be a good time to buy options on GLD. GLD at 84.40 in August is mighty cheap. I would suggest 950 strike price with Jan09 expiry. Please refer to http://www.gold-prices.biz/buy-gold-call-options/ for more details. Mr. Sam Kirtley of gold-prices.net appears to know what he is doing, but I do have to say I should have bought in smaller tranches options on Yamana Gold as at one point I was at a 60% loss on the options. Such strategy may have given me a better average in price. As of now with averaging down( I averaged in at $1.95 per contract) and a rebound in the PM Markets, I am only at a 25% paper loss, which is comparable to the dogs in my portfolio with over 50% in paper losses. If past is prologue I see my juniors slightly rising in the fall, but not fully recouping my losses. I feel that I can expect to be in the green with Yamana options by October w/ a 100% profit. If I can follow Mr. Kirtly's advice and take 100% profits with an expectations of the traditional January sell off in view, I could with proper acumen do another setup for another 100% profit, but I get ahead of myself. I think it is an excellent idea that Bull would hire Mr. Junkin as a chartist/market timer. I see a portfolio as having half a core position with other half devoted to market timing as one good scenario, but of course you may want to fine tune that according to your preference for risk. I would like to humbly submit that I am just a rank amateur at this sort of thing. The best of luck to my fellow junior mining investors. God knows we have suffered enough. This is good; the black line has crossed over the red line. I have a feeling I am going to in clover. Sometimes it's not all it's cracked up to be, not that I would know, but so I hear. I'll keep my fingers crossed as well. RBC Capital Markets raised its outlook on Yamana Gold Inc. to "Outperform" from "Sector Perform" on Wednesday, citing a positive outlook for gold and the Canadian company's growth plans. Yamana shares closed Tuesday at $10.41. They've traded in a 52-week range of $9.26 to $19.93. In a note to clients, RBC analyst Michael Curran said he viewed the drop in gold prices in recent months as "the summer doldrums." "Whether or not last Friday's intraday low of $772/oz proves to be the summer 2008 low for gold, we believe many gold equities are at attractive entry points for a subsequent seasonal rally in the fall or later this year," Curran wrote. As for Yamana, Curran said strong growth plans and liquid gold equities have led shares to realize higher leverage to the price of gold than several other large-cap producers. RBC maintained its 12-month price target for Yamana at $17 a share. Yamana, based in Toronto, has operations in Brazil, Argentina, Chile, Mexico, Central America and the United States. As it stand now the Yamana option is only worth 5 cents. I suppose I could wait for some miracle or I could sell it for some beer money. I heard that Jim Willie, John Embry and Jurg Kiener had spoken of a gold default in December. I don't know if that is just so much nonsense or if I should wait.